For years PD (the name I refer to the husband here to retain his anonymity) had been telling me that one day he was going to get a tattoo. He’d wanted a black panther permanently inked on the inside of his forearm. I’m not exactly sure what he was waiting for but it just never happened. Then a couple of years ago when he became a huge fan of The Airborne Toxic Event, he started talking again about getting a tattoo but of something to do with the band. Then more recently, the band Train‘s song Calling All Angels moved him to want a tattoo of the song title surrounding an intricate cross. I’d had some money saved up and when his birthday came in April, so I made a coupon good for the tattoo of his choice and tucked it in his birthday card. It was then that he started very seriously thinking of getting inked. He spent a lot of time researching and deciding on exactly what he wanted. But it came to the point where he couldn’t decide between his two final choices. Neither one a panther, anything to do with TATE nor Angels. I had an extra day off after we returned from Buffalo last Sunday and we decided that we would take that time and go visit a studio we’d always wondered about. And we did, mostly just to ask some questions and check out prices, etc. The studio had six artists on staff and only one was not busy. Jerry began talking with him while I was nosing around at tons of pictures framed on the walls. The artist’s name was Matt. After talking a bit, Matt left the room and PD confided that he seemed strangely familiar to him but couldn’t place him. Anyway, he showed Matt the two designs that he’d taken pictures of on his phone. The larger of the two designs, Matt said would take a couple of hours and PD would have to make an appointment. They decided that Wednesday would suit both of them. PD asked if he could possibly have the time to do the smaller tattoo and Matt studied it a bit and said that he could. I’d never dreamed that when we walked in there that PD would be walking out with a tattoo. PD filled out a release form while we talked to Matt and he answered a ton of questions that we thought of during the course of the conversation. Matt made a stencil of the tat and checked with PD to make sure the size was good for the inside of his left forearm. Being that we hadn’t planned that PD would get a tattoo that day, I didn’t have my camera so I will only have the one “after” picture to share. But I asked Matt if he would mind terribly if I did a blog post about the next session and he was very receptive. So Part II will be more in depth and have pictures to go along. Here is the end result. 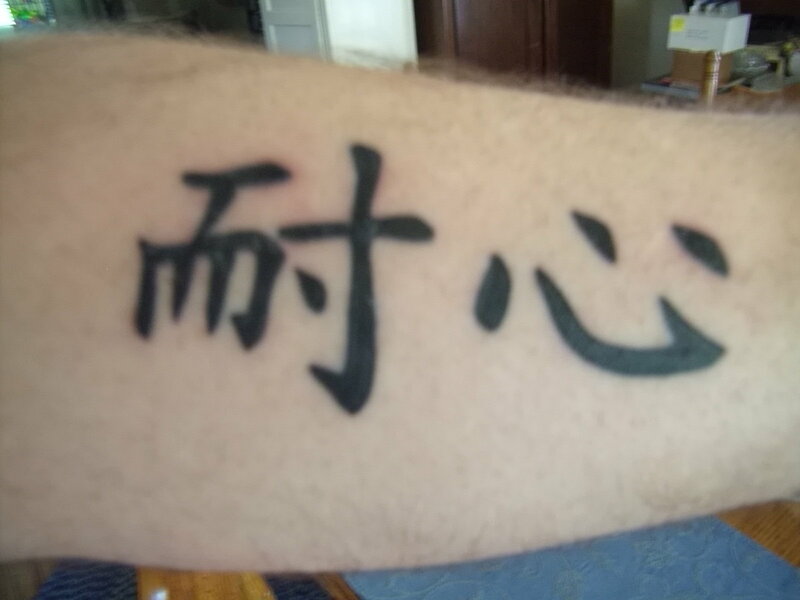 It is the Chinese symbol for Patience and PD is hoping that it will be a constant reminder of something that he feels he lacks on a fairly regular basis. I think it looks great and suits him. He’s quite happy with it also.